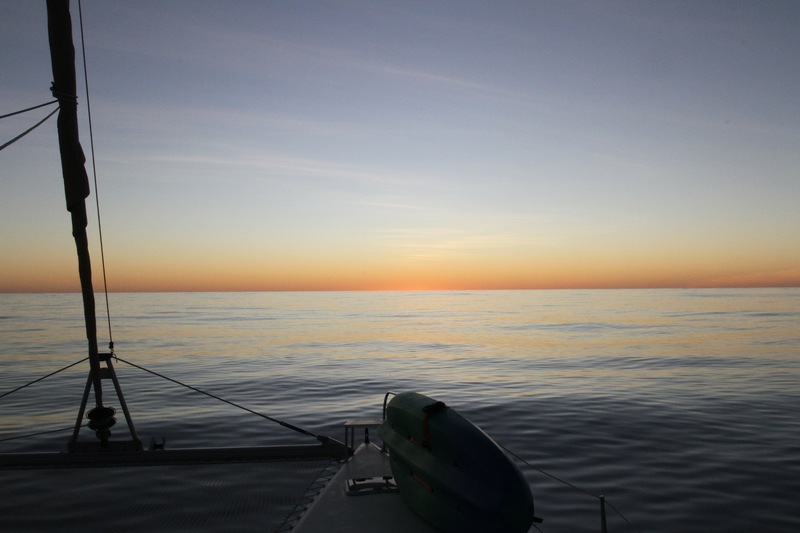 We’ve now been travelling across the Pacific Ocean for six months, covering 6000NM. 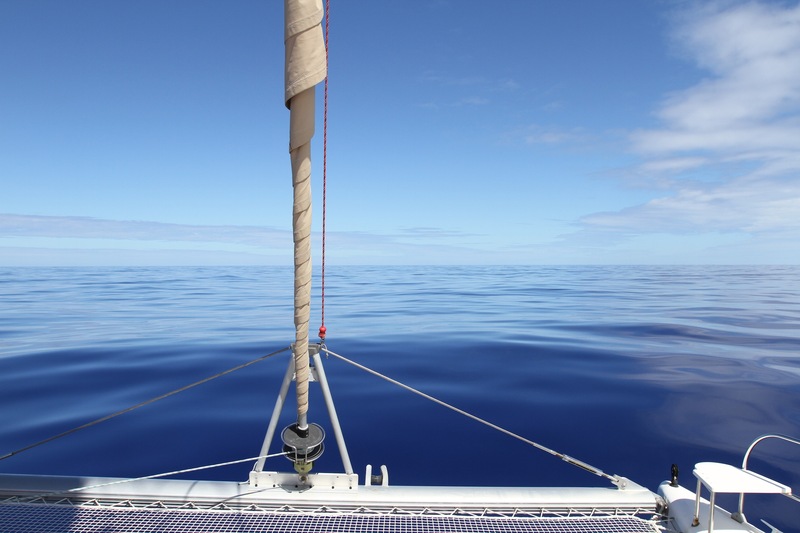 And for most of those 6000NM we’ve been bitching about the ‘un-pacific’ nature of this huge expanse of water. Instead of a lazy, fat, rolling labrador of a sea, we’ve often encountered something more akin to a pit bull terrier – strong, pugnacious and unpredictable, with a nasty bite occasionally. So it should have come as no surprise that Neptune eventually got fed up with our griping and gave us what we wished for, in spades. This is about as pacific as the Pacific could possibly get…. For 48 hours we were treated to the sight of this huge beast at rest. 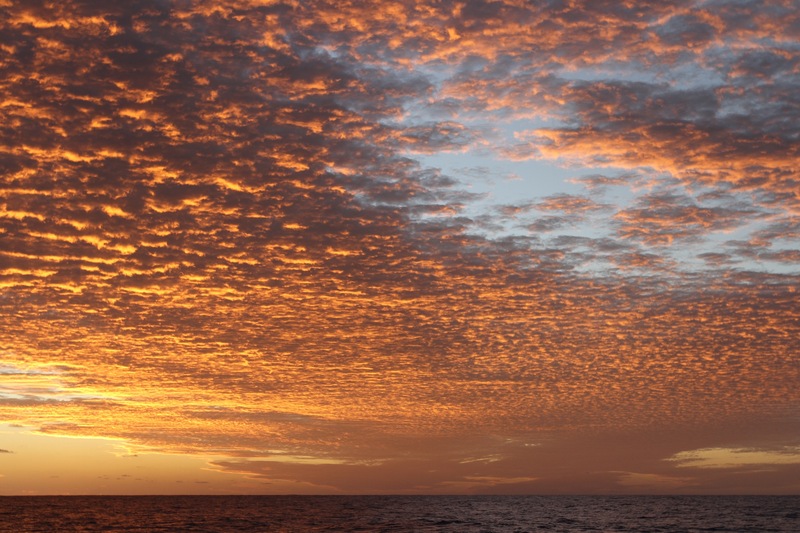 And how beautiful it was, with some of the most glorious sunsets and sunrises we’ve experienced. It was also a full moon, so the nights were amazing – almost as bright as day– the sea a silvery-black glistening mass. In the daytime it was like being adrift on a bed of the bluest blue silk. We’re not quite zen enough yet to be able to drift and wait for the wind to come in (will we ever be?! ), so we motored for two days, Bruce quietly chewing his fingernails as the fuel gauge dropped, me quietly revelling in the serenity. 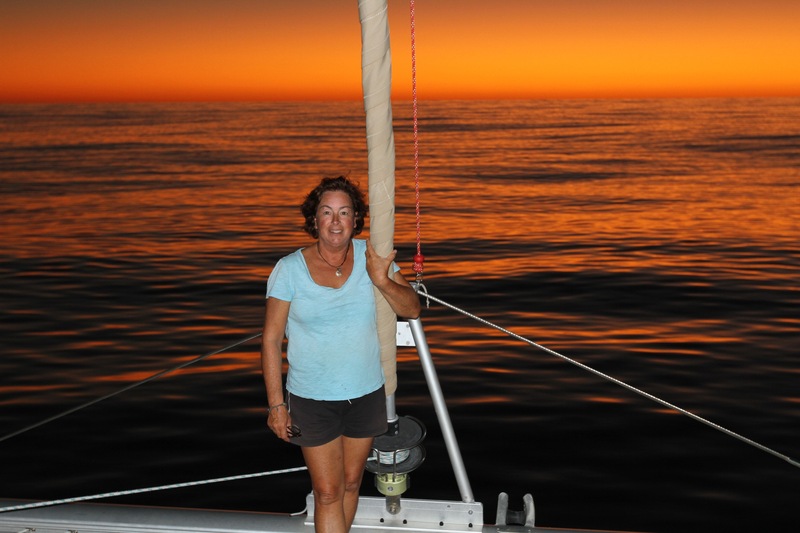 Unfortunately we were going too slow to have any hope of catching fish, but we were able to make water, hang out the washing, relax over dinner and for once not have to worry about wind angles and sail trim. I certainly wouldn’t want too much of these conditions, but it was a welcome interlude from the crashing and banging that we’re more used to. No colour enhancement here – it really was that red! As the high moved through and the trough approached the wind started to come in, ever so slowly inching its way round from east, to north, to north-west and finally coming in strongly from the south-east, with rain squalls and gusts up to 25 kts. Back to crashing and banging and 2 reefs in the main! But at least we were under sail and making good speeds of 7-8 kts. 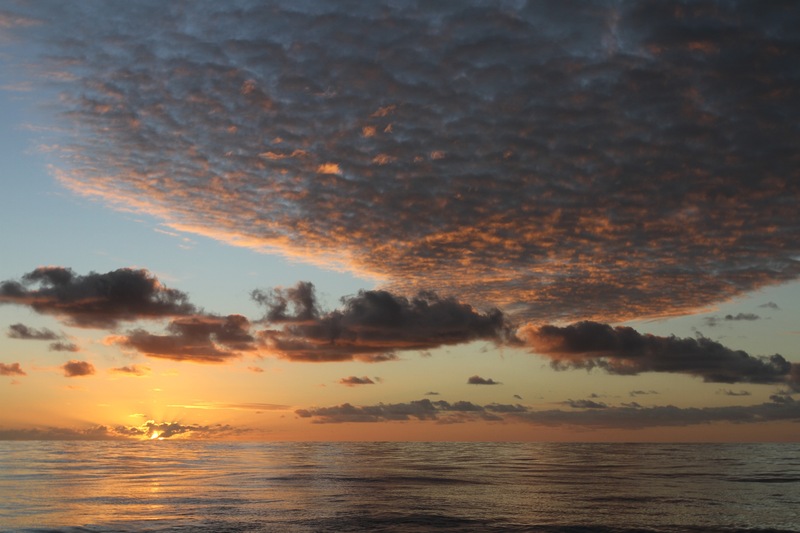 When we set out from Aitutaki we hadn’t decided whether to stop at Niue or keep going to Tonga, but as Niue came into sight on the dawn of our 5th day at sea, and with the wind continuing to strengthen, common sense prevailed and we made the decision to stop for a few days in Niue. 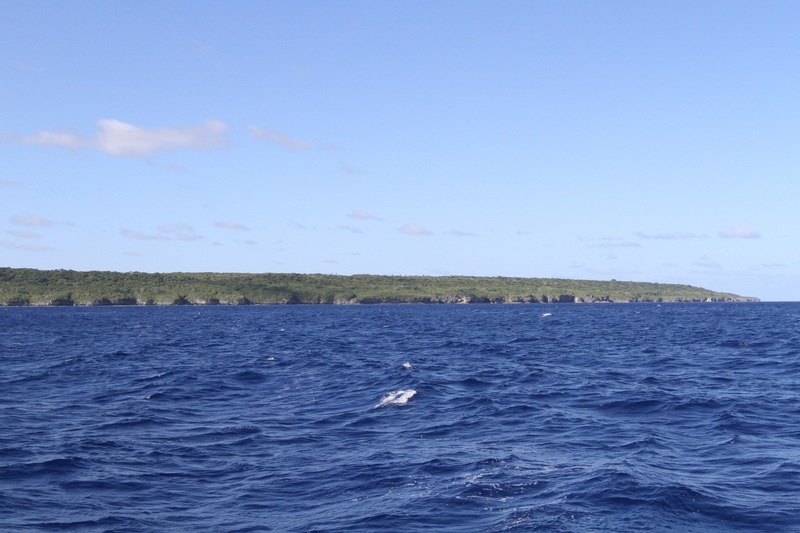 And what a good decision it proved to be – more about delightful Niue coming soon. 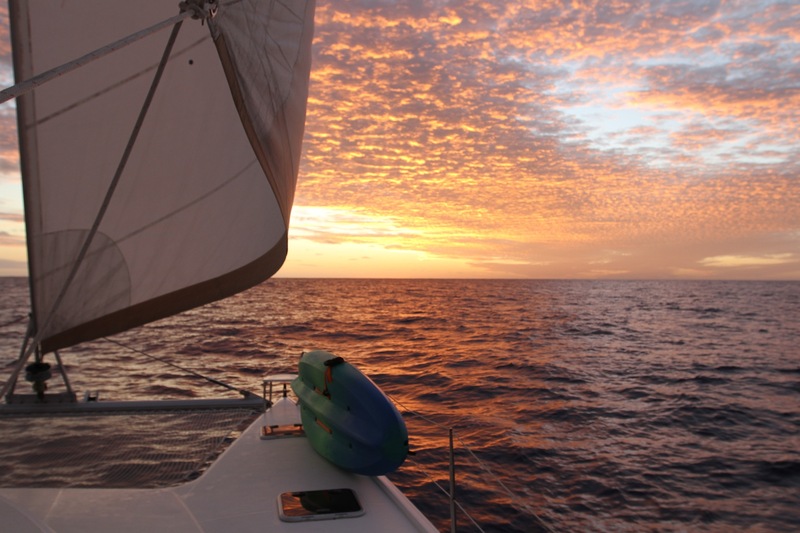 Now that’s my idea of lovely sailing – it sounds like heaven!! (ignoring the fact you had to motor) haha! It was a guilty pleasure Linda!